We installed sleek new superloos on all levels of this Grade II Listed mixed use building as part of a recent refurbishment programme. 6 Duke Street is located in the heart of London’s prestigious Marylebone district. The Grade II Listed regency-style building boasts an imposing Portland Stone façade. The building is home to two art galleries on the ground floor, an exercise studio on the lower ground floor and high quality office accommodation on the remaining floors. The refurbishment programme involved refreshing the common areas and office space to provide Grade A standard accommodation throughout. Great care was taken by all involved to ensure that the building retained its character and heritage, while creating a space suitable to meet the demands of 21st century office workers. As part of the refurbishment, we installed new unisex superloos on each floor, along with disabled facilities to exactly the same design and finish. 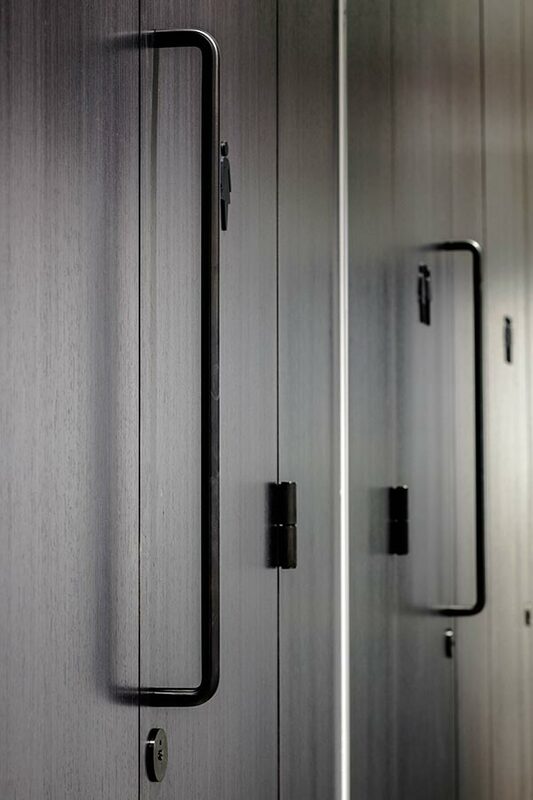 The self-contained cubicles include a toilet, vanity unit and hand drying facilities, all enclosed behind a standard, full height Alto cubicle door. Being unisex the superloos provide a more flexible approach to traditional commercial washroom layouts and so save valuable floor space. 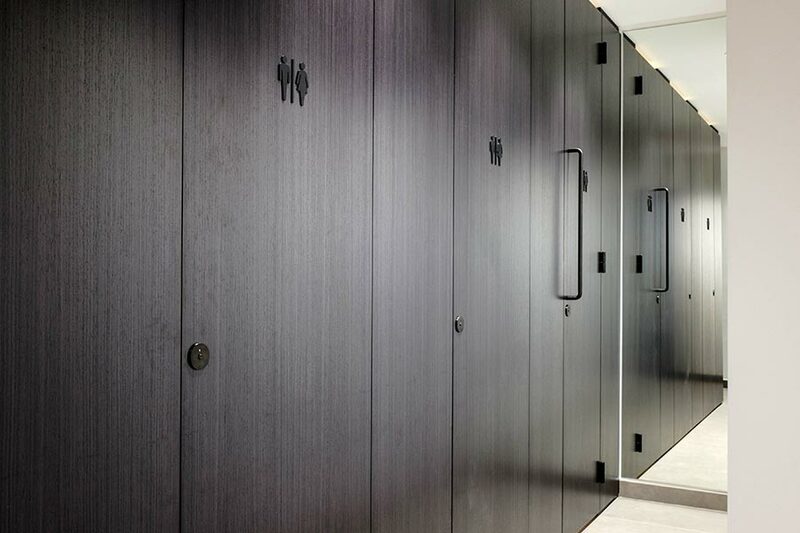 Our full height, flush front Alto toilet cubicle doors were specified with a Koto real wood veneer finish, which was stained to an attractive dark colour while highlighting the naturally straight end grain of the wood. 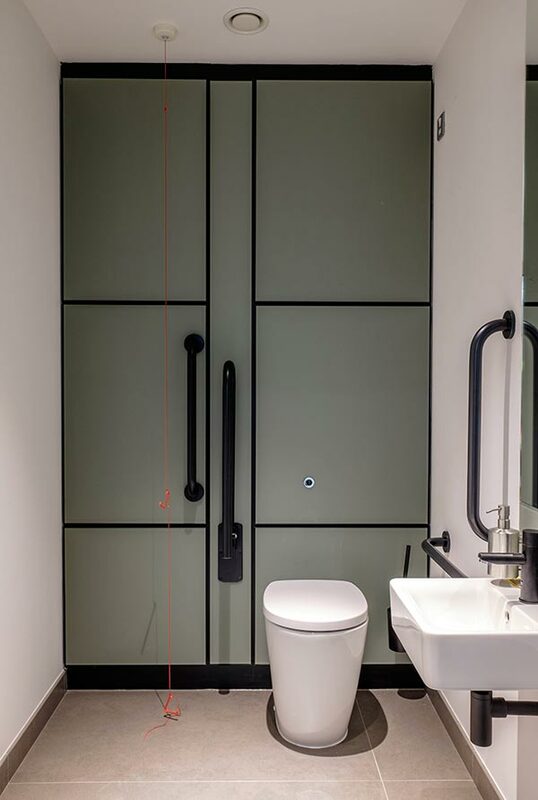 Stylish matt black powder-coated ironmongery including door handles, locks, hinges, toilet roll holders, taps and male/female signage complete the minimalist style to create a unique washroom space. 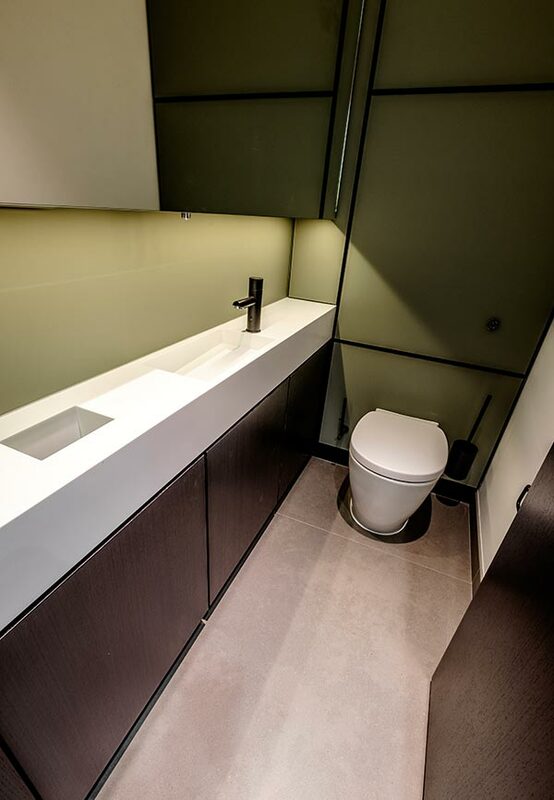 Each cubicle features a bespoke white Corian vanity unit with integrated waste bin and inset sink with sensor-operated tap. 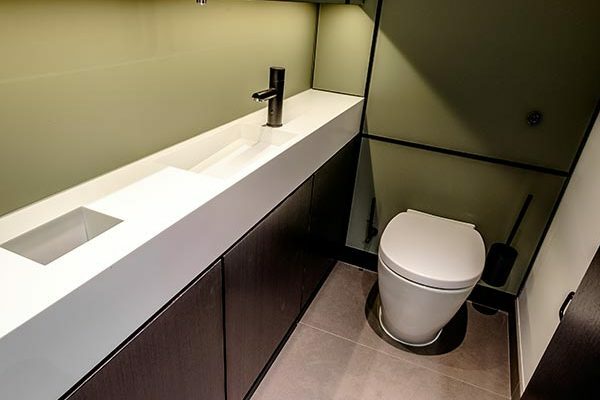 The crisp angular lines and natural stone-like appearance of the Corian vanities, which were each manufactured from a single piece of Corian, adds to the sleek design. 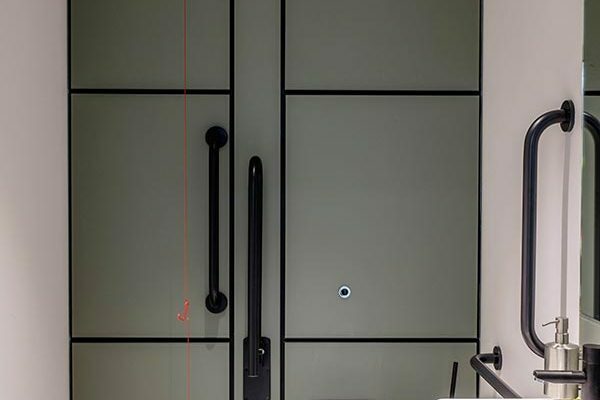 Hygienic and highly durable, Corian is easy to maintain, making it an excellent choice for busy commercial buildings like 6 Duke Street. We also installed our Concerto integrated duct panelling system to full height behind the toilets in each cubicle. 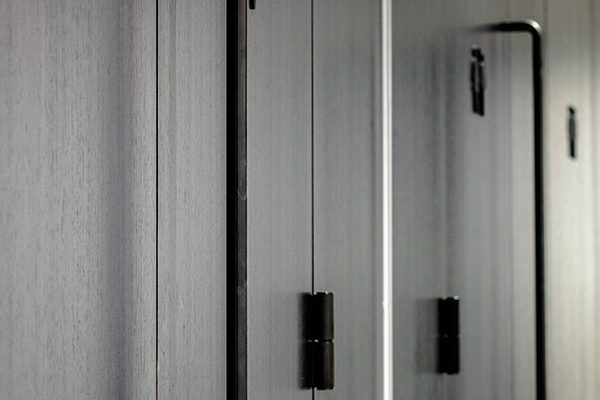 The panels, which were faced with 6mm toughened glass, back-painted to a dark gold colour to complement the dark wood of the Koto veneer cubicles, are designed to be easy to clean and allow ease of access for any future repairs or maintenance.